Thanks to Andye at Reading Teen for sending me her ARC and hosting me as a guest blogger! The summary is certainly correct in stating that Avalon is similar to Firefly. 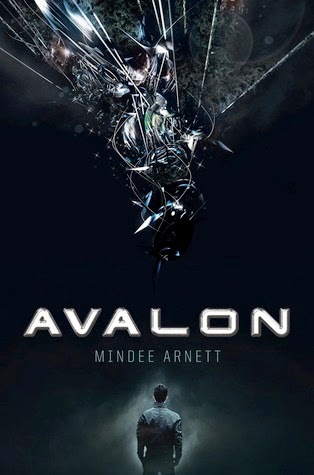 This was one of the main reasons why I wanted to read Avalon so badly, and it turned out that there were many similarities to Firefly in the book. In fact, at first I was annoyed with it because the story didn't seem very unique. Luckily, the book turned out to be full of surprising twists and I ended up liking it enough that I'd like to read the sequel. I liked all the characters, and I had no trouble keeping track of all of them since they were basically similar to the characters in Firefly. But I couldn't help thinking that for other readers who haven't seen Firefly, all the characters might be confusing. And although I did like the characters - especially the main character, Jeth, and his snarkiness - I say "liked" lightly, because they never really felt very original. The only two that stuck out to me were Jeth's sister, Lizzie, and the love interest, Sierra. Lizzie is a lot like Kaylee in Firefly, but I liked how she and Jeth were siblings and had such a sweet relationship. And Sierra is pretty much the only character that can't exactly be matched up to a character in Firefly, so I liked her character's complexity. The plot had its ups and downs for me. The first half starts out pretty slow, but I couldn't put the book down for the second half. There's a lot of tense action scenes and plenty of twists. I did guess one big twist because I've seen Firefly. *sigh* But I'm happy to say that there were a couple other twists I didn't see coming that really shocked me. And with that great ending (it ties up the main storyline but leaves a couple unanswered questions) I can't wait to read the sequel. Also, I should mention that this book is pretty heavy on the sci-fi side. While I love reading sci-fi, sometimes the descriptions and explanations can be confusing. But on the other hand, it shows that the author did her research, so I liked that too. On the whole, I'm conflicted about Avalon. It has many similarities to the show Firefly, but it does have a strong plot, solid writing, and likeable characters. I did criticize it a bit, but I still enjoyed it and I'm glad I read it. I'm definitely going to read the sequel because I'm hoping it will be a lot more original and unique. I'd recommend Avalon to those who haven't seen Firefly. Otherwise, I think you'll find it a bit disappointing. Content: Heavy violence and strong language. It can be a little gory at times - Jeth and his crew stumble upon dead bodies in a spaceship, characters are brutally tortured, etc. There's quite a bit of language, including a couple f-words and a few uses of the s-word. There was also some kissing and mild innuendo. I don't know Firefly but have heard the comparison. I really enjoyed this book. At first I was worried b/c it seemed like it was going to be scary, then it was ok. I'm glad. Did you read the novella? Hi Brooke! No, I haven't read the novella, but I'd like to get around to it eventually. :) Have you read it?